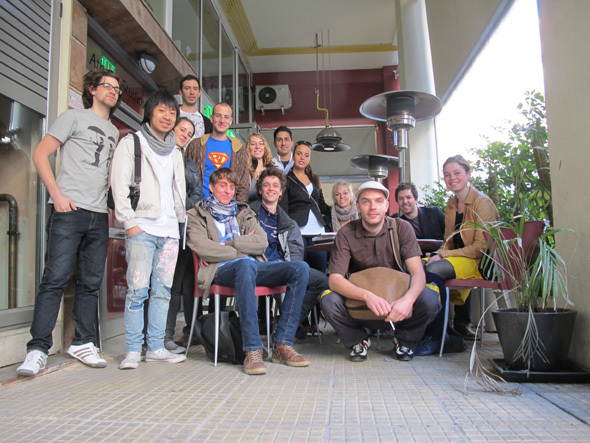 Photographs from the final review have been added to the EPFL Organicités Studios Flickr photostream. I am Franck. I am French. I am sorry. The goal is to create a facade composed by the modular panels system which is an tessellation geometry like a tetris. 6. Making a gradient of these parameter to analyze in grasshopper and get an parametric variation on the facade. The observation of the negative aspects of the existing towerhas been taken as the starting point of the project :bad propostions were making the building look too massive. In order to react on this aspect, the decision was taken to fragment this mass and go away from the rectangular perception of the tower in order to let the building breath with some public spaces. and the other from closer, to provide different perceptions and adapt to natural conditions. The shaping of the building is contextualized with the surroundings : the fisrt step has been to take some pointsaround the building such as the acropolis, the station, the park, some piers, the end of the harbour. Those points are then transformed into vectors by linking them with the closest corner of the tower. They are then scaled accordind to the same factor for each vector. Those vectors are then distributed according to their length on the tower, and they are used to translation vectors from the corner in question to the new view point. This principle is applied for the middle part of the building, corresponding to office program. The bottom part is already contextualized by the close relation is has with the surrounding, while the top part is starting to lose connection with the context because of its height. If we take a look at one storey only, we can see that 2 points are defined by the minimum space the fire stairs will take and one by the view. The last point will be determined in order to keep a fixed ratio of 30% per floor of extra space. When the view point correspond to the same corner as one of the fire stairs points, it creates instead a 5 side-polygone. From far away, the main idea is the shaping and the framentation of the tower, while we can have a glimpse at some opaque and transparent zones. The sections evoque the connection with the public space. Before, the public space ended at the edges of the building. With this project, the public space goes into the building as a connecting void. It reuses the existing passage as a monumental entrance, reaching a floor with a café, and continuing straight to the fire stairs for the rest of the tower. The structure is composed mainly with 2 facets per floor, connected at the floor height to the existing pillars. Sometimes some higher facets are set when there is pulbic space behind. The first layer is composed of glass following the faceting, each panel having a width of about 2.5 m according to truck transportation, while the external pattern is added, with some losanges taking the porportions of the big facets and scaled according to two parameters – one visual and one technical. The parameters are used both as scaling factors for the losange pattern. The first one derives form the sun incidence on each of the facet. It is being calculated and then influencing the scaling. The gradient on each of the facets indicates the level of sun intensity on them : the white represents the less exposed faces while the black shows the most exposed facets. The second is about creating a fluidity and continuity between the facets to have an impression of a whole. Therefore, the values of scaling inherited from the image in grasshopper are comprised between 0 and 1. A perforated concrete facade with randomly positioned openings wraps the skeleton of the Piraeus Tower. The homogenous texture of openings breaks with the strong verticality of the skeleton and introduces a notion of mass, pronouncing the strong presence of the tower at Piraeus port. Type B: A box-type window consisting of a simple window in combination with a exterior glass panel. This window type operates as a natural ventilation device. The hot air in the buffer zone rises and evacuates air from the interior spaces. Type C: A balcony between a recessed window and exterior glass panels. The balconies create natural ventilation as well, but only if several of them are stacked on top of each other forming a vertical shaft. Each opening is assigned a window type according to the three main environmental parameters: Noise, sun and wind. The data describing these parameters is translated into image maps. Using the RGB additive color model, all information can be condensed into to a single image. A script evaluates the parameters for each window position. A lot of noise or wind demands a box-type window that offers more protection than just a simple one. Where the sun intensity gets more important than noise pollution or wind forces, a simple window is preferred because it diminishes the danger of overheating the interior as there is no heat radiation from a heated thermal buffer space. The balconies are only placed in areas without strong noise so that they always offer a calm recreation space. Once the window types are assigned, there’s a recursive function that analyses the stacking of the balconies that is required to contribute to the natural ventilation of the building. Only stacks of at least three balconies are admitted. The remaining balconies are reassigned and become openings of type A or B. Then an other script places the exterior glass panels in front of the balconies. These glass panels have their own rhythm that is independent from the rhythm of the openings. The glass screen becomes an autonomous layer added to the perforated concrete facade. These two facade layers are working together and against each other at the same time. The resulting panel pattern gets analyzed and recursively modified within the script: Where there are columns of at least six panels on top of each other, the proportions of the thermal buffer required to produce a chimney effect allow an increasing depth of the balconies. A heatmap illustrates the ventilation covering of each floor by analyzing the distances to the next ventilating window. This feedback allows to detect problematic zones with a lack of ventilation. In turn, parameters can be changed in order to achieve a satisfying result (red area limited to the core of the tower). The south eastern facade turned out to be the most delicate in terms of ventilation covering due to it’s high percentage of type A windows. That’s why the fire escape stairs are located at this facade. The shaft of the stairs operates, like the stacked balconies, as a climatic device contributing to natural ventilation. The path of the stairs is defined a script within the engine: The stairs avoid balconies and cover the areas on the facade that are the least ventilated. It introduces a fourth window type, the stairs type, that fills the ‘gaps’ on the south eastern facade. Further possible reactions to an unsatisfying heatmap feedback are relaunching the initial random window repartition, changing the number or the dimensions of the openings or change the ratio between small and large openings. The latter is usually set around fifty-fifty in order to create the typical facade image of the stacked balconies creating stepped shafts. The plinth with it’s regular window interval is wrapped with glass panels as well. These glass panels are placed by a random based engine that takes in count three layers of information contained in a single gradient map (curtain effect gradient, noise protection, passage openings). A script places the panels by evaluating the map to calculate chance of a panel being placed for each possible panel position. All these steps lead to the following facade proposal. The stacked balconies create a distinct drawing on the facade of the Piraeus Tower and turn it into an iconic landmark. The concrete facade is made out of precast insulated elements, which are attached to the existing slabs. The exterior glass panels are hold in place by articulated metal beams that make the transition from the rhythm of the concrete facade to the rhythm of the glass panels. These beams penetrate the concrete facade and are fixed to the existing slabs as well. A cross bracing that allows to absorb the lateral forces is achieved by polygonal beams that follow the contour of the balconies joining the cantilevered beams. -The exterior layer reflects a important part of the sunlight and serves as sun protection. -The increase of temperature between the two layers of glazing produces an natural ventilation effect. -The exterior glazing can become larger and be placed on the exterior of the concrete facade forming a grid of panels. -These panels can take a distance to the facade that allows a balcony in between. -The panels are fixed 4-armed with metal beams attached to the slab and reinforced with a DuPont Sentryglass interlayer to increase their performance. -The panels might change their materiality: Opaque elements as sun protection or photo voltaic panels. The openings in the concrete facade are still placed by an algorithm that chooses a random position and one of four sizes for each window. The higher the floor, the more probable to get a large opening. These random openings however stay in a rigid grid. This grid allows a compatibility with the layer of glass panels, that sticks to the same grid. The algorithm also defines the location of balconies (at the moment the balcony positions correspond to first defined windows of type L). These balconies are used as starting points for the DLA algorithm that defines the placement of the glass panels.There are 3 types of panels: panels close to the concrete facade, panels distant enough to wrap a balcony and a third type in between. The panels that were first created by the algorithm are the most distant to the concrete facade. The spreading panels produce a distinctive image linking the different balconies. These options allow to get a denser repartition of the panels with less branches. It is a great honor and pleasure for GreekArchitects.gr the fact that a department of architecture has chosen to use the architectural competition as part of the educational process and indeed to participate with many different proposals. This fact shows that the choice of the specific issue overpass the narrow topographic boundaries of Greece and constitutes an object of problematic at a wider level, by promoting simultaneously Athens internationally. I modified the 3D DLA VB component in order to get a list of lines between each new point and it’s neighbour. The starting poins lies on the xy-plane. Every new point is positionned one level higher in z-direction than his neighbouring point, once it has found one. That means every branch is growing upwards. Why am I interested in cable-membrane tensile structure/skin? 1) Structural: The structure of Piraeus tower has not been protected for the 30 last years. Maybe we can’t afford adding a heavy façade. The “cable-membrane tensile structure/skin” is very light. 2) Economical: Economical situation in Greece is not at the best. Are the materials of a “cable-membrane tensile structure/skin” cheap? To be verified.. But it is possible to create large formal variations with the exact same pieces. 4) Comfort/Ecology: Looking at the interior photographies of the tower, they seemed pretty dark: it seems that the sunlight is not so strong. But still we know that in summer, the sun in athens is very hot, and a glass façade could result in overheating. These translucent membranes don’t block light, but offers a protection to sun rays. © 2010 MxD. Designed by Nathaniel Zuelzke based on proudblack and SuperStudio by Labelle.